All dogs adopted from us are spayed/neutered, up to date on vaccinations and receive veterinary exams. Once your application is submitted, we will be happy to arrange an appointment for you to meet our dogs. 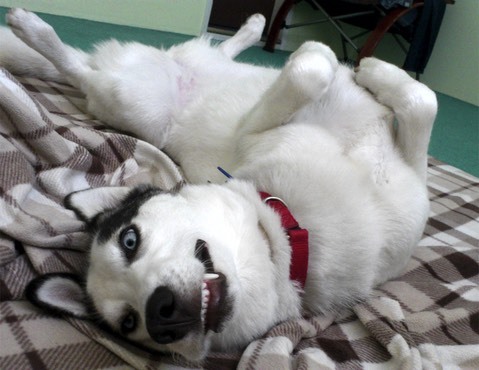 Please give your adopted husky a minimum of a 14 day trial to allow both you and the dog to adjust. Pet ownership is a serious responsibility, and we ask you to make a lifetime commitment to the dog. Our rescue dogs are from shelters, we know little of their background or history. Although each dog is assessed and we work with them to deal with behavioral issues, we cannot make any guarantees regarding the dog’s temperament or behavior. We try very hard to make a good match between adopter and dog to ensure that the dog is a good fit for your family and lifestyle, but it will also take your commitment, dedication & work, to integrate your adopted dog into your family. We ask that you give the adoption a minimum 14 day trial to allow you and the dog time to adjust to the routine and circumstances in your home (incl. both week days & weekends). Many adjustment issues occur after you have spent your weekend fussing over and spoiling your new family member, then when everyone goes back to work or school, the new dog is left to their own devices and may experience stress or separation anxiety. There is a detailed application to adopt. The application is not designed to invade your privacy, only to ensure that we make the best possible match for you and our dogs. Some adopters also find the application helpful as it identifies potential issues that they may not have considered. Once you have submitted your application, we will gladly arrange an appointment for you to meet our dogs. Introductions are by appointment only. We ask that if you have another dog or dogs, you bring them to the appointment to have the dogs introduced properly and to check to see if the dogs will get along. We are a large breed rescue focusing on Siberian Huskies, some of which are considered a hunting and roaming breed by nature. We cannot make any guarantees about how they will react to cats or other small animals. Some of these dogs get along well with cats, or can be taught to live with cats and other small animals. Introductions must be completed carefully, and an adjustment period must be expected. We have tips available but we recommend that you read about the process of integrating cats, small animals and dogs. You must be aware of these issues and be willing to work with both animals before we can approve adopting any of our rescue dogs to a home with cats and/or smaller animals. We are completely self funded and ask that, when you adopt, if you are able to give more to help us rescue more dogs, please do. We rely on extra donations to help us continue our rescue work. 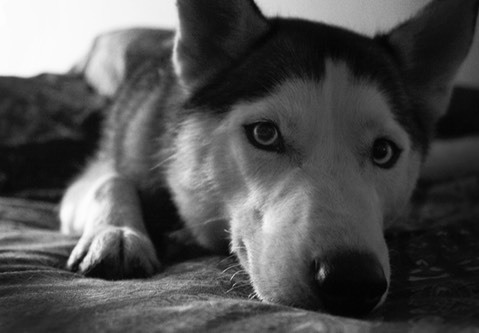 We are a nonprofit 501(c)(3) rescue, our Siberian Husky adoption fees range from $175.00-$500.00 per dog. We base our fees on our costs to get our dogs ready for adoption. This includes shelter fees, spay/neuter surgeries, vaccinations, high quality food, micro chipping (w/paid lifetime registration), dewclaw removal (if needed) pain medications, antibiotics, any foster care needs, supplemental formula for our infants, all and anything our dogs need. They are vet checked to clear for adoption. Our investment in each dog generally exceeds our adoption fee. Puppies under 4 months of age may or may not be spayed/neutered, these adoptions will require a trust deposit to be paid by adopter to ensure puppy is spayed or neutered within 60 days. Once proof is provided trust deposit is returned. Puppies under 4 months of age require a series of vaccinations which will be started by rescue but adopter must agree to complete the series at their own veterinarian. Please understand that our main concern is the welfare of the animal(s) and our goal is to place each dog in the best possible home. If you need to return your adopted dog you may do so anytime during their lifetime. Adoption fees are cash or check only. We are happy to have helped you find your new canine companion! This is a binding agreement between Alleys Rescued Angels (also referred to as ARA Canine Rescue Inc), and adopter(s). By initialing below after each section I agree to abide by all terms and conditions. I have read and understood all of the acknowledgements listed above.